At least a couple of reviewers choose the Under Armour Drive 4 Low over the original high-top version. A good number of buyers say that these low-top Under Armour basketball shoes are light and comfortable. The same can be said about the Nike PG 3. Many purchasers are saying that the UA Drive 4 Low looks great. Some players are saying that like the HOVR Havoc, this shoe grips the floor well. At least one reviewer says that the UA Drive Low causes blisters. One reviewer did not feel that the mesh upper works as expected. Some commenters are claiming that these low-top basketball shoes run small. The Drive 4 Low is a decent performance shoe from Under Armour. It is light and comfortable, and it is loved by many because of its amazing aesthetics. There are blistering complaints and issues regarding the material, but these are matters that can easily be addressed by properly breaking the shoe in. For a budget model, I'm not mad. They were nice to play in. It's the fit that was kind of annoying and the problem I have with this (tongue). The UA Drive Low can now be a called a versatile shoe. It has a better fit, less annoying support and it’s a tad bit cheaper. Boasting top-notch UA technologies such as Micro G cushioning and Anafoam quarter paneling, the Under Armour Drive 4 Low delivers an unrivaled court experience that helps you elevate your game. 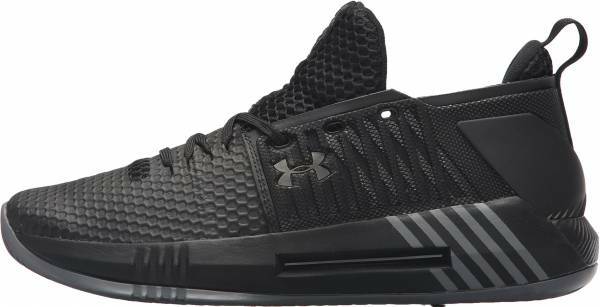 These UA basketball shoes also feature a 3D shank wrap, lightweight mesh upper with TPU coating, and full-length herringbone traction to help you drive down the lane with full confidence. Cushion. The Under Armour Drive 4 Low has a compression molded EVA (CMEVA) midsole carrier that delivers lateral containment. At the heel, an exposed Micro G unit adds a layer of firm cushioning to provide a comfortable ride. These UA basketball shoes also come with a die-cut EVA sockliner that offers added underfoot cushioning and support. Traction. The Under Armour Drive 4 Low has a rubber outsole that features a full-length herringbone traction pattern that offers maximum court grip and control. Length and Width. According to retailers, these Under Armour basketball shoes run true to size. Buyers are advised to order their normal size. Lockdown. The Under Armour Drive 4 Low’s lacing system has reinforced lace loops for heightened durability. The Anafoam quarter paneling offers lightweight support and structure, at the same time delivers a body-mapped fit. These basketball shoes also feature an external heel counter that provides additional support and keeps the heel locked-in. A 3D shank wraps up the shoe’s sidewall, creating a flexible platform that increases lateral stability and torsional rigidity. The Under Armour Drive 4 Low features a dynamic upper construction with regional flex zones that is engineered to move with the foot naturally. The lightweight and breathable mesh upper is reinforced with TPU coating while a toe wrap enhances forefoot durability. The UA Drive 4 Low’s full-length bootie construction comes with a cushioned tongue and ankle collar for added comfort and support. With an updated upper and a lower profile, the Under Armour Drive 4 Low has a very different vibe from its high-top counterpart. These basketball shoes are designed for quicker players who love to drive fast to the basket. These Under Armour basketball shoes were unveiled by NBA rookies Dennis Smith Jr. of the Dallas Mavericks and Josh Jackson of the Phoenix Suns during the 2017 Rookie photoshoot. Aside from the vibrant color schemes donned by newly signed UA athletes Dennis Smith Jr. and Josh Jackson, the UA Drive 4 Low comes in several mixtures of more toned colors such as Overcast Grey, White, Midnight Navy, Royal, Steel, Graphite, Metallic Silver, Black, Peirce, and Red.